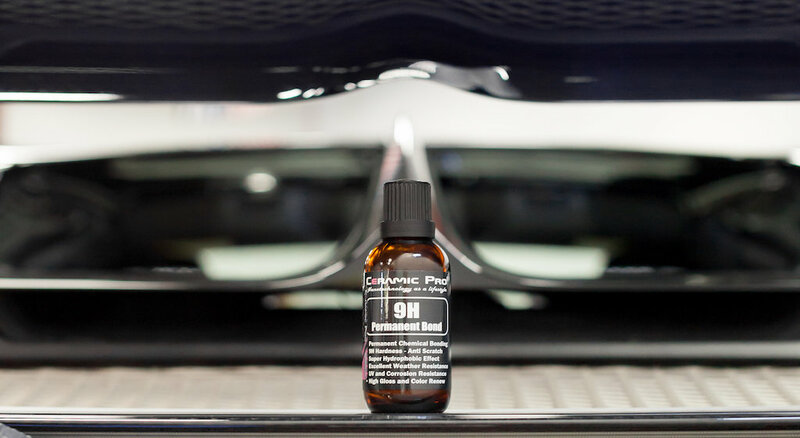 A Ceramic Pro Lifetime package comes with a full detail and paint correction (if necessary), four coats of Ceramic Pro 9H, and one coat of Ceramic Pro Light. Ceramic Pro Light acts as a top coat, giving you a great sheen and self-cleaning effects that keep you spending more time enjoying your car and less time cleaning it. We also throw in Ceramic Pro Rain on all of the glass of the vehicle for free. Ceramic Pro coatings are such a great products because they’re sprayable and layerable. Unlike clear bra (PPF), they don’t need to be cut to size and they conform to any of your car’s angles. They also deepen the shine and gloss on your paint job, making even a factory paint job look luxurious and high end. We find that people like to combine the Lifetime package with clear bra. That gives you the best of both worlds — Lifetime warranty through Ceramic Pro for scratches, swirls, environmental fallout, acid rain, and so on, and a long-term warranty from the clear bra on rock chips (which is the only thing that Ceramic Pro doesn’t protect against). Here in St. Louis, we see a lot of weather that affects our vehicle, from harsh UV rays in the summer to de-icers in the winter. That means that vehicles, even daily drivers, need more protection than just waxes and regular detailing. Lifetime packages of Ceramic Pro are great because they keep your car from rusting or corroding over the life of the vehicle. Not only that, but its self-cleaning effects means that water just beads right off. St. Louis Auto Detail was lucky because we managed to get in on the ground floor of Ceramic Pro. Our shop has more experience than any one in Missouri and we’ve got an experienced, dedicated staff. Our guys are just as excited and just as careful about your car as you are — and it shows in the finished product. Ceramic Pro is a one of those products that its uses are only limited by your imagination. It gives top quality protection without compromising the look of your vehicle.